40 years of wear and tear mean that City YMCA London's hostel in London is worn out. Building a new home is the best chance for 10,000 young people that will be forced into homelessness over the next 60 years. Plans are well developed with the costs planned at £19.4m. With significant funding already secured we are appealing for help to make this vision a reality. We're asking London's businesses and citizens to join our appeal to build a new, flagship home for those who have no hope. Everyone can get involved from just £5 to over a million. You can choose to buy a brick, sponsor a room or name the building! Your gift will allow us to start construction and will provide much needed accommodation for London's homeless young people. City YMCA London offer you the opportunity toggle a second chance to one of London's homeless young people. In return we'll acknowledge your support. City YMCA London is an independent charity affiliated to the global YMCA movement founded in the shadow of St Paul’s Cathedral in 1844. Our work is based on the ethos of the international movement and we work across some of London’s most deprived boroughs of Islington, Tower Hamlets, Newham and Hackney. We passionately believe that every young person should have the opportunity to build a future of their own choosing. Over the past forty years we have helped 30,000 isolated, homeless young people struggling with family breakdown, school exclusion, poor mental health and drug and alcohol problems. From emergency beds through to supported longer-term accommodation our hostel occupancy currently runs at 98%, a stark demonstration of the need for this provision. Our services are delivered on a case-by-case basis with a support route mapped for each young person. Residents are monitored through a 3-step pathway measuring Involvement, Progression and Attainment. Our Board of Trustees meets six times a year with additional sub-committees for Audit, Fundraising and Development. Our Chief Executive, supported by a team experienced in Operations Management, Finance, Fundraising, Youth Projects, Facilities, Housing and HR, reports to the Trustees. Performance management systems include regular staff supervision, annual appraisals and quarterly management reports. An appointed housing consultancy leads a professional team of building specialists on the Errol Street development. The team reports directly to the Chief Executive to ensure the project is designed and constructed in accordance with legislation and best practice. A construction contractor will be appointed in accordance with our procurement policy of pursuing three competitive quotes. We are confident this will ensure that the project is cost effective and that monitoring and quality control will be achieved. 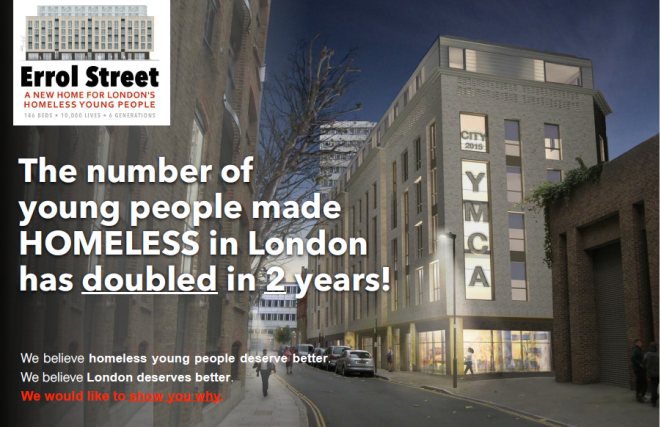 For over 40 years City YMCA London’s Errol Street hostel has met the needs of homeless young people. But no more! The 1980’s designed building is no longer fit for purpose and fails to support a young person’s transition to independent living, their health and their welfare. Small bedrooms, shared shower and toilet facilities, limited disability access and the lack of individual catering arrangements all restrict the ability for young people to establish some measure of self-dependence. A lack of outdoor social spaces, fitness facilities and bike storage restricts their physical progression to adulthood. Failing boilers, sewage pipes and worn out facilities restrict the hostel’s on-going viability. 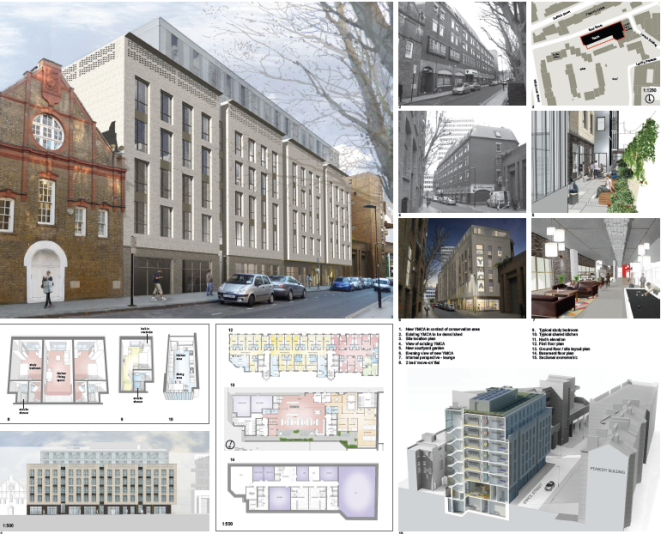 Following consultation with residents and professionals to consider all possible options, City YMCA London’s trustees have concluded that a total re-development of the Errol Street site is the only viable option. A new hostel will ensure the best opportunity for London’s most ‘at risk’ young people for 60 years. In a climate in which young people are increasingly squeezed out of London’s housing provision, we recognise the importance of providing a modern, safe, secure and supportive home that allows young people to remain within their local community, creating the best environment in which to work with young people and provide them with the support, guidance, motivation and skills to make the transition to successful, independent lives. The scale of the project means we cannot fund the work in full from reserves. Our bank loan requires that we raise funds towards the project costs. Loans will be repaid from the rent proceeds over the next 15 years. The redevelopment plans for Errol Street, with the increased bed spaces, training, gym and recreational facilities will enable the charity to become self-sustaining and invest in new youth services. 1. How many people will benefit? Young people currently stay with us for 9 months. With 146 rooms that means that over the course of some 60 years we will provide a lifeline to some 10,000 young people. That's before the surplus that the hostel will create allowing us to re-invest into new detached youth work services across London. 2. How much is the project costing? After a first round tender process we have tied the project costs down to £19.4m. Whilst we will go out to tender again we are confident that the revised tender process has eliminated areas of uncertainty for the selected contractors and will therefore come in near to this price. 3. How much funding is already secured? That leaves us just under £2 million left to raise. The above plans still rely on a £6m mortgage. That's a huge commitment for a charity. Every penny that we raise will allow us to reduce that mortgage commitment allowing us to invest any surpluses in future years into support for London's homeless young people. 5. How do you know that the hostel is needed? Our current provision constantly runs at 98% occupancy rates. The only reason that's not 100% is the few days between residents moving out and into a room when maintenance work is often required. Also, we regular are forced to close our waiting list as we simply don't have the rooms to offer young people. 6. How we you fund the hostel when it's open? We already work in partnership with Islington and Hackney Councils in working out a funding formula around Housing Benefit that covers the costs of running the hostel. This will act as a guaranteed income for many years to come. Infant the charity will become self-sustainable when the hostel is opened. We will be able to start to invest in a new programme of detached youth work across London. 7. What if Housing Benefit is removed by the government? We don't believe that Housing Benefit will go in its entirety, especially as the young people that we are working with are homeless. They have no where else to turn. Even the current government changes include exceptions to the rule and we are working with some of London's most-at-risk young people. 8. How does this 1% reduction in social rent affect the project? We have already built this government enforced rent reduction over the next four years into our budgets. As the hostel won't open again until 2018 the current scheme won't impact us much and is manageable. 9. Where will the young people go when you close? We've been working hard on our aim that no young person from Errol Street will be made homeless when the hostel closes. We have secured a 15 year lease on Monarch Court which provides 87 beds and Errol Street residents will have the first right of refusal for these rooms. We will then create a rent deposit scheme to secure move on accommodation for other residents. It's going to be tough but when you remember that young people stay with us on average for 9 months, then a number will be moving on naturally already. 10. Are all your young people really homeless? Yes, we only accept young people who are referred through professional agency channels. You can't self refer so they have all been vetted before being taken through our own application channel. 11. Can I come and see for myself? yes we would be delighted to meet you in person. Please contact us. 12. When will the building work be completed? Our plans are to open the new hostel by the summer of 2018. Of course building projects are notorious about running over schedule but a Design & Build contract will include penalty clauses for any overrun.